Which WiFi Encryption is Best? Encrypting your wireless network accomplishes two things: it helps keep out leeches (i.e your neighbours) who would otherwise use your WiFi for free Internet, and it helps prevent intruders from breaking into your system to snoop around your PC. Wired Equivalent Privacy (or Wireless Encryption Protocol) is the original protection scheme included with early wireless routers, and it is also the weakest. With the right software, an intruder can easily break into a WEP-protected network in a few minutes using the Related-key attack. This is considered almost obsolete technology so use WEP only if you have older PCs or devices that don’t support the newer types described below. WiFi Protected Access was established as a stopgap measure to remedy the vulnerabilities in WEP. If you have any Windows XP machines on your network, they’ll need Service Pack 2 to connect to a WPA encrypted network. Specifically, the Temporal Key Integrity Protocol (TKIP), was brought into WPA. TKIP uses R64 encryption for securing data. Also known as 802.11i or PSK for Pre-Shared Key, WPA2 is the completed form of WPA, and is considered the strongest nonproprietary encryption scheme for 802.11x wireless networks. 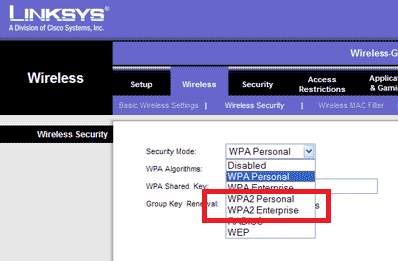 WPA2 implements the mandatory elements of 802.11i. In particular, it introduces a new AES-based algorithm which is considered fully secure and better than TKIP. There are reported cases when some websites won’t get browsed properly if you are under ASE so try to use TKIP and see if it will fix the problem.